It may seem hard to believe, but there are gardeners who can’t be bothered with vegetables. For a vegetable lover such as myself, every vegetable is interesting and unique, but one this year has stood out – for its flower! Even I found myself far more interested in the flower than the vegetable. 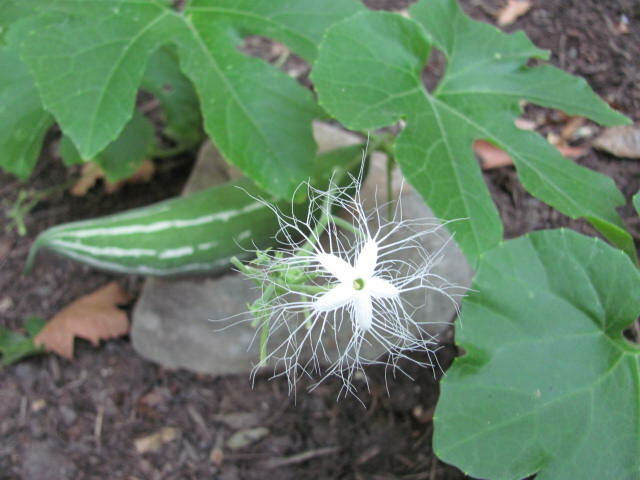 The snake gourd is a very interesting vegetable in its own right, but I’d never grown it before and had no idea that it emerged from such an amazing flower. 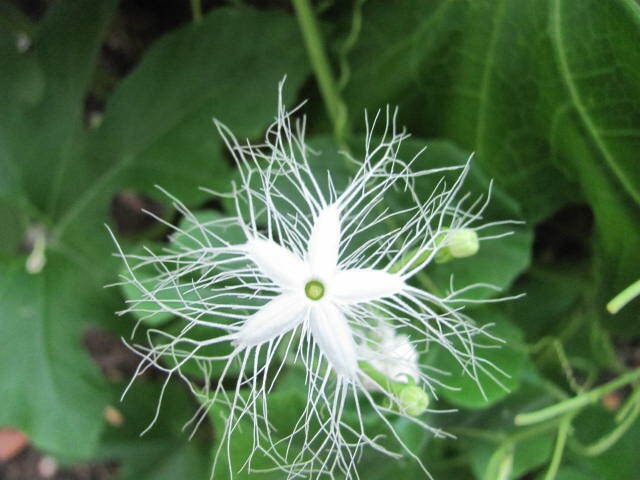 Wikipedia notes that the flower opens only at night but I saw it first on an early morning stroll in my backyard where the snake gourd has room to roam. 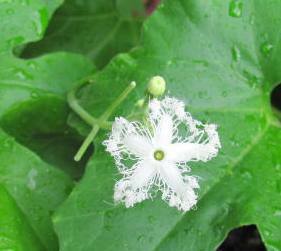 The snake gourd (Trichosanthes cucumerina), has many names depending on the country or region it where it is grown. 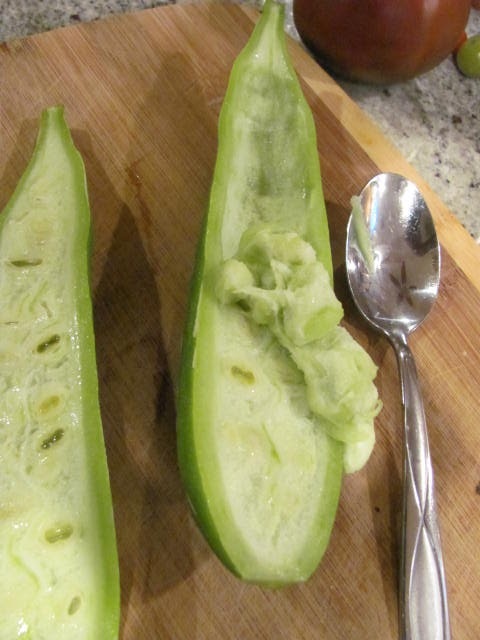 It is popular in South and Southeast Asia, and unlike the bitter gourd, the taste and smell are delicate like a cucumber, and easily manipulated by the desires of the cook. But first, the flower – not only are there a multitude of delicate tendrils all opened to form an orderly web, these same tendrils curl up during the hot daylight hours when they are done showing off. In fact they curl up in such a way that they are able, once again, to re-open, untangled, soft and complex. The leaves too emulate this delicacy. They are not as light as the bitter gourd, but not heavy like the winter squashes. I can’t think of a better way to soften a landscape than with this fast growing and beautiful vine. Of course, the vegetables are also striking. Reminiscent of zebra stripes, the striped pattern on each gourd is unique. Each vine produces huge quantities as though it needs to feed the world. Even my veggie eating family cannot keep up with the product of just two plants. For the person who does not have a lot of time to cook, this vegetable is a true gift. Since you eat the skin, there is no struggle as with many other gourds, and the seeds inside may be scooped out with a spoon in seconds. The insides may be brushed with a mild lemon garlic flavor or something very spicy, depending on your taste—the snake gourd absorbs flavor like chicken does. Stuff it with the combination of your choice. 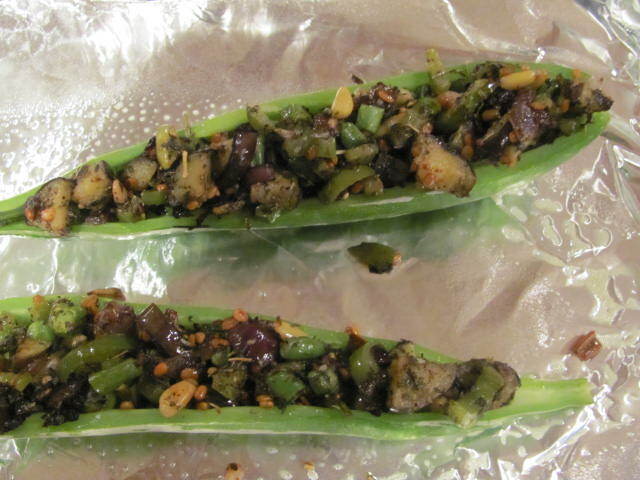 I used the ingredients from my garden (above), a spice packet from Pat Kenny, plus roasted pine nuts to fill the snake gourd boats. Bake, serve and enjoy. The snake gourd accommodates many tastes and schedules. If you are not up to the boat option provided above, you can chop the snake gourd and toss into curries, soups, or mix it in with stir fries. Or, steam the chunks and toss into green salads. Another easy preparation is to chop and toss into a sauté of onion, garlic, ginger and some garam masala, and serve. Toss chilled leftovers into a tomato salad, or top with yoghurt and mint. 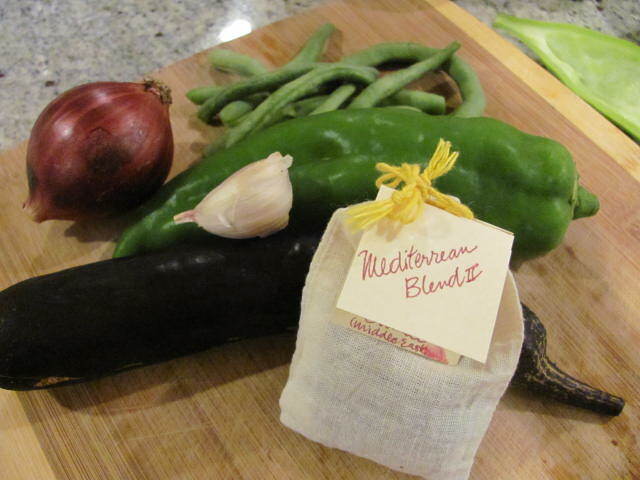 The options are endless with this versatile vegetable. I began the season wondering what new thing I would grow this year, but soon became pre-occupied with community garden matters and getting down to the hard work of reconstituting a new community garden plot. 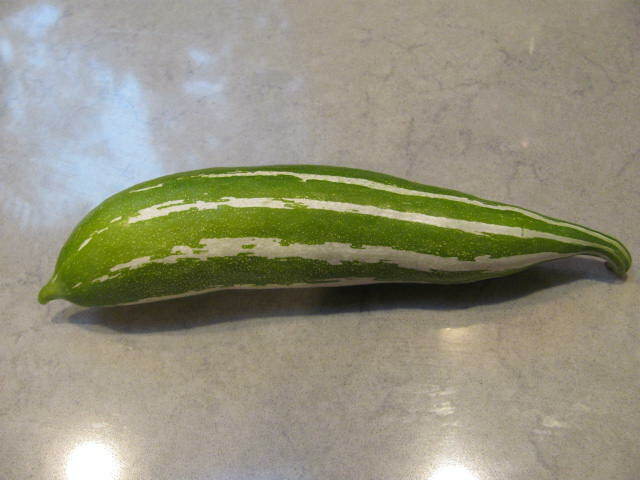 It was not until mid-July that I noticed the snake gourd plant. Once it makes itself known, there is no stopping it. For now, it has added excitement to gardening, and renewed motivation to look forward to the Fall growing season. Wonderful seed to table post. The filled boats convinced me that I need to try it!